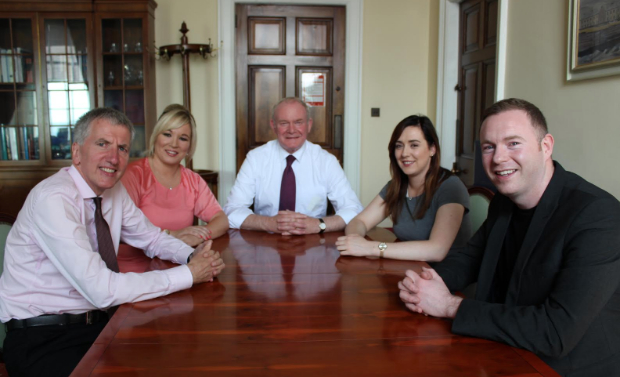 SINN FÉIN's Martin McGuinness has announced his party's Ministerial team for the new Assembly term. Under the d'Hondt system the party's 28 seats mean it is entitled to three Ministers and one Junior Minister. The party has nominated Michelle O'Neill (Mid Ulster), Máirtín Ó Muilleoir (South Belfast), Chris Hazzard (South Down) and Megan Fearon (Newry and Armagh) for the ministerial roles. While Michelle O'Neill has previously served as Minister for Agriculture and Rural Development, the party's three other nominees have not previously held ministerial roles. Newly-elected South Belfast MLA Máirtín Ó Muilleoir is the former Mayor of Belfast, chairperson of the Belfast Media Group and publisher of the Irish Echo newspaper in New York. He is also a fluent Irish-speaker. 31-year-old Chris Hazzard first joined the Assembly when he was co-opted in 2012. The party's Education Spokesperson during the last term he has been a tireless worker in tackling rural isolation and promoting the identity and integrity of rural communities. Finally, 24-year-old Megan Fearon was also co-opted to the Assembly in 2012. The party's spokesperson on Women, Children and Young People she sat on numerous committees including the Finance and Personnel Committee, Enterprise, Trade and Investment Committee and the All Party Group for Children and Young People. Sinn Féin has also announced that its north Belfast MLA Carál Ní Chuilín, who formerly served as Minister for Culture, Arts and Leisure, has been selected as Party Group Leader and Chief Whip. Alongside the four ministerial positions, Sinn Féin will also be entitled to chair three committees and will have three seats on the Policing Board. “The task ahead of us will be extremely challenging as the Tory party continue to resolve the issues of the past and build unity, reconciliation and equality,” Martin McGuinness said. The individual ministerial posts will be selected tomorrow.